It's (mostly) good news, but there are a couple of things investors should be looking out for. 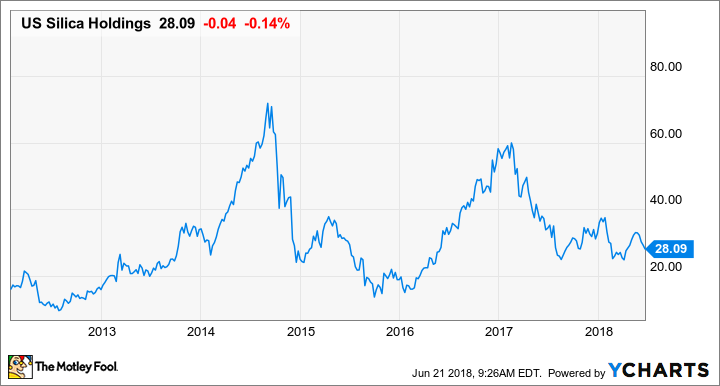 Investing in frack sand supplier U.S. Silica Holdings (NYSE:SLCA) has been a roller-coaster ride to say the least over the past few years. First, everyone on Wall Street was clamoring to get into frack sand when shale oil and gas were getting their start in the first half of this decade. Then, oil prices started to crash, and demand for frack sand dried up fast. Now that oil and gas producers have significantly lowered costs and are using more sand than ever, demand is red-hot again, but investors don't seem to be interested. It's a busy time at U.S. Silica right now. It's working on adding new frack sand capacity, absorbing a major acquisition, and trying to figure out what to do with its newfound glut of cash coming in the door. Here are three important takeaways from the company's most recent conference call, and what investors should make of the whole situation. While I'm very proud of the work that our team is doing, we are behind the originally planned start-up timelines for our new West Texas facility, as are many of our competitors, demonstrating the many challenges of bringing new capacity online in this difficult location. We continue to believe that local sand production will come online much slower than many predict, and further that demand will grow much faster than our industry can bring on capacity, further exacerbating the current very tight market. Shinn tried to spin the news as best he could by explaining that U.S. Silica isn't the only one struggling to get new mines running in this region, and that it will simply make demand for its product that much greater in the future. The bottom line is that an excuse salad like this one doesn't cover up management's struggles to deliver. Even though U.S. Silica's expansion project in West Texas hasn't gone as smoothly as expected, it hasn't kept management from making other big moves. Back in March, management announced it was acquiring EP Minerals, a company that specializes in products made from diatomaceous earth and other clays. The goal of the acquisition was to balance out U.S. Silica's operations such that it wasn't as closely tied to the oil & gas industry through proppant sales. First, it fits within our core competencies as a mining and logistics company. Also, they have a very attractive market structure and are number one in the U.S. and the number two player globally. They've historically had strong margins with double-digit EBITDA growth every year over the last decade and very reliable cash flows. They have diverse markets with over 10,000 customers and high recurring revenue. On top of that, they have identified several bolt-on growth opportunities and possess a robust pipeline of new projects in various stages of development. If there is one thing that was noticeably absent from U.S. Silica's presentation materials and conference calls, it's the potential operational or sales synergies that this deal could generate, which adds fuel to the argument that this may not be the best fit. The deal closed in May, though, so we'll have to see what the company's earnings look like over the next few quarters to get a feel for this new acquisition. I think the first important point here is that we will be generating tremendous amounts of cash in the coming quarters and over the next few years as we get this oil and gas capacity ramped up and running. I would expect that we'll have hundreds of millions of dollars a year of free cash, and so we'll think very carefully on how we allocate that. Later on in the call, management also went into the details of how it expects to spend that money. As it stands, it doesn't foresee making any more significant investments in new mines, but the first priority for excess cash will be to plow more capital into its last-mile logistics service, Sandbox, and other smaller capital commitments with high rates of return. Then there's the fact that the company took on quite a bit of debt to pay for EP Minerals, which will need to be addressed. Even after addressing these two things, though, management thinks there will be plenty of cash left over to keep buying back stock (it recently completed a $100 million share repurchase program) as well as increase its dividend. At 13 times trailing earnings, shares of U.S. Silica do look pretty cheap today, especially with EP Minerals and its West Texas sand facility sitting in the wings as potential growth levers. The two reasons investors may be a little hesitant is that the EP Minerals deal and its new mine might not pan out as well as management has been pitching it, and that sand producers are a little overambitious with their demand estimates. Also, it's worth considering that demand from the oil and gas industry can swing wildly since producers can ramp up or slow down development rather quickly. Despite these concerns, U.S. Silica looks like a rather attractive stock right now. The chances of a significant downturn in sand demand seems a bit far-fetched as producers have reduced costs so much, and global oil supplies are tightening. So, the proppant side of the business should stay strong for a while. That will help cover up any blemishes the company may have while integrating EP Minerals, and it should allow management to pay down debt before that becomes a more pressing issue.